On display at the Bodleian Library, Oxford University until October 20th, 2018. 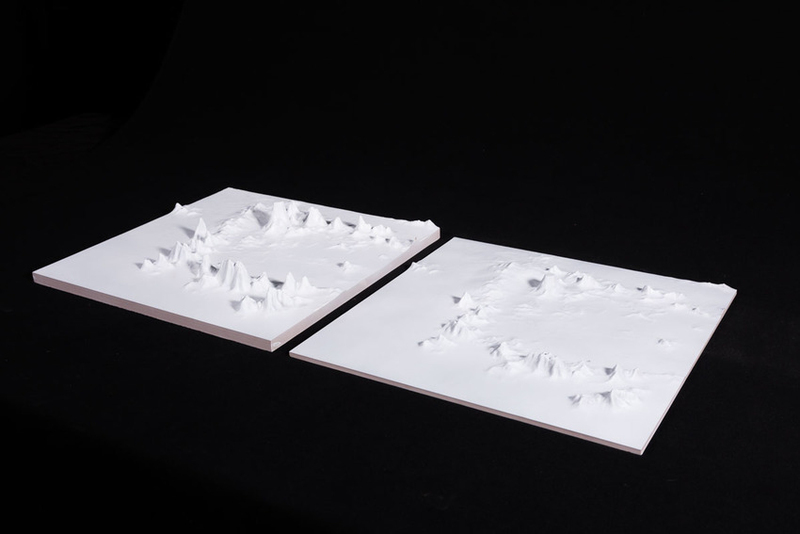 A dynamic 4D map with front and back animation made by Factum Arte in conjunction with Factum Foundation. 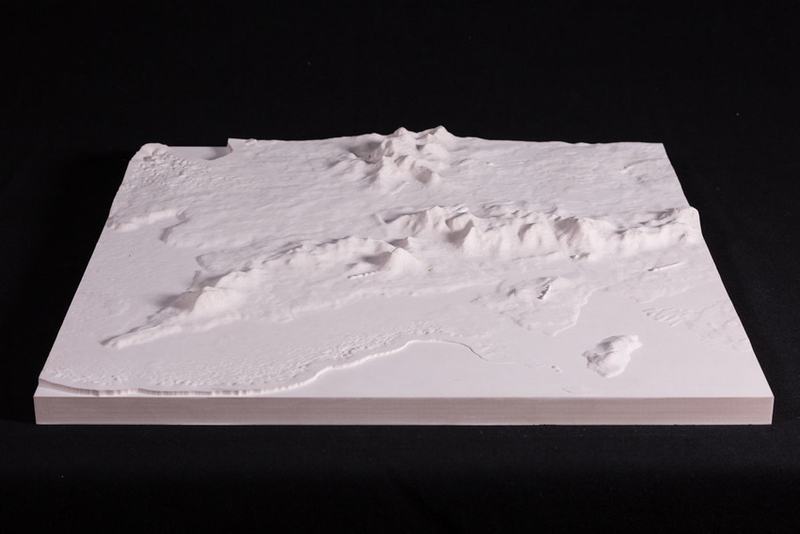 In 2017, Factum Arte was approached by the Bodleian Library, at Oxford University, to make a physical 4D map of Middle-earth for their exhibition of Tolkien's drawings and manuscripts. 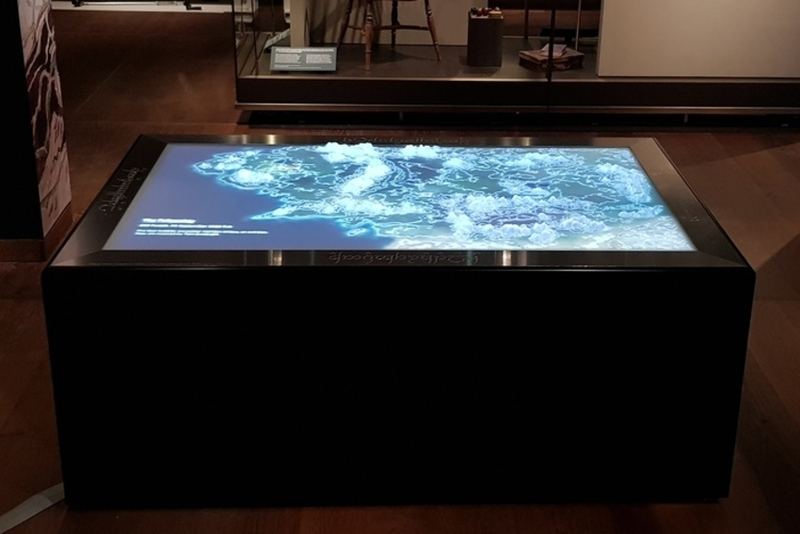 The exhibition, entitled Tolkien: Maker of Middle-earth, has opened to the public on June 1st, 2018 and will run through until October 28th in the Weston Library in Oxford. 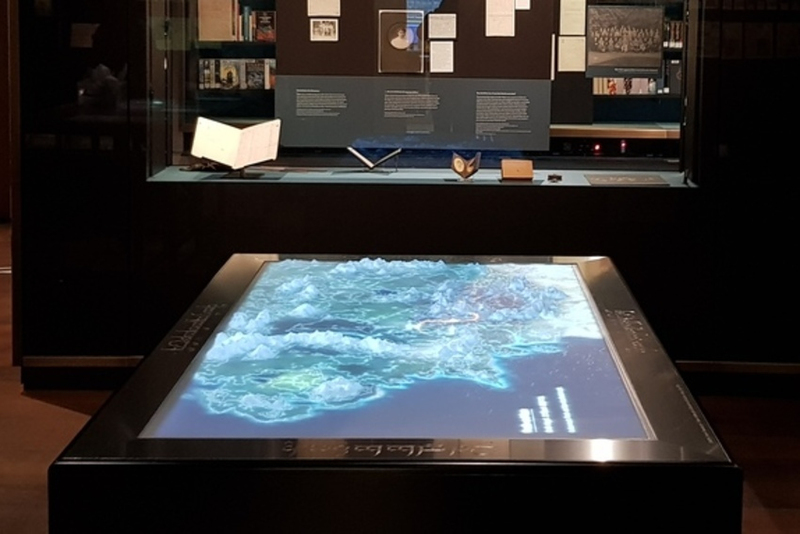 The exhibition is about Tolkien's process of world creation for his magnum opus: the Lord of the Rings; and features sketches, manuscripts and his development of elvish languages, among other things. The map that Factum Arte made for the exhibition is a physical relief map, made according to Tolkien's illustrated map of Middle-earth. 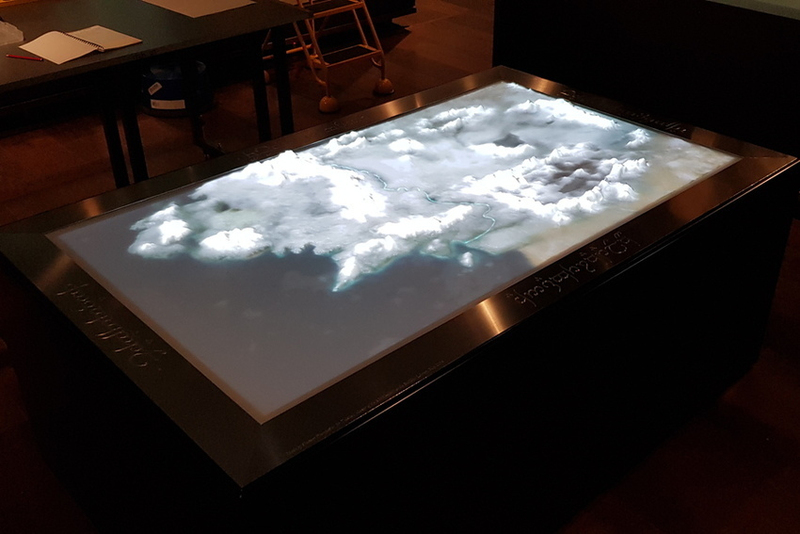 The map features a back and front animated projection, that has been mapped onto the relief, to display the geography, topography, and the journeys of the protagonists of the Lord of the Rings. The animation is projected from above by a projector, and from below by an 85-inch television screen. 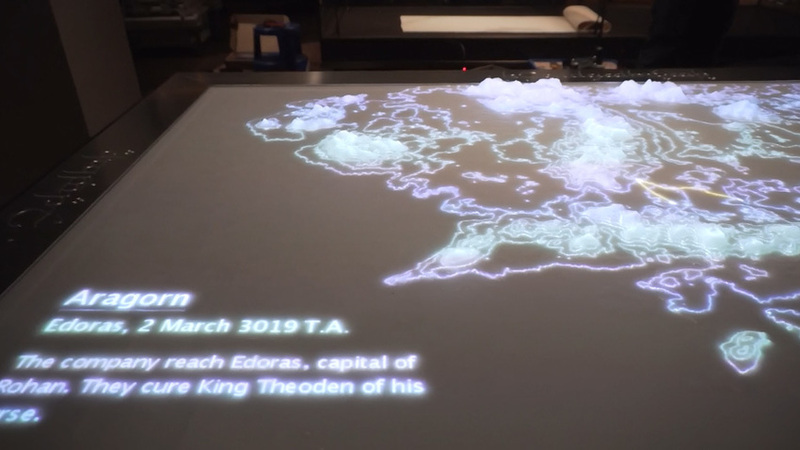 The back projection serves as supplementary background information to the projector and is displayed through the map, which has been routed in a translucent resin. The projection features the journeys of several groups of the main protagonists. It begins with the group setting out from Hobbiton, and splitting up at Rivendell. The animation then displays the journeys of the different groups, interspersed with a changing visualisation of the map itself, and culminating in the destruction of the ring in Mount Doom. Throughout the process, the team at Factum Arte was in contact with the Tolkien experts at the Bodleian, to make sure that the caption, names, locations and dates were all correct. The project was overseen by Otto Lowe; the animation, and the map were done by Jorge Cano and Eduardo Moriana, assisted by Pedro Miró and Enrique Esteban; routing and design of the plinth were done by Francesco Cigognetti and Carlos Alonso. 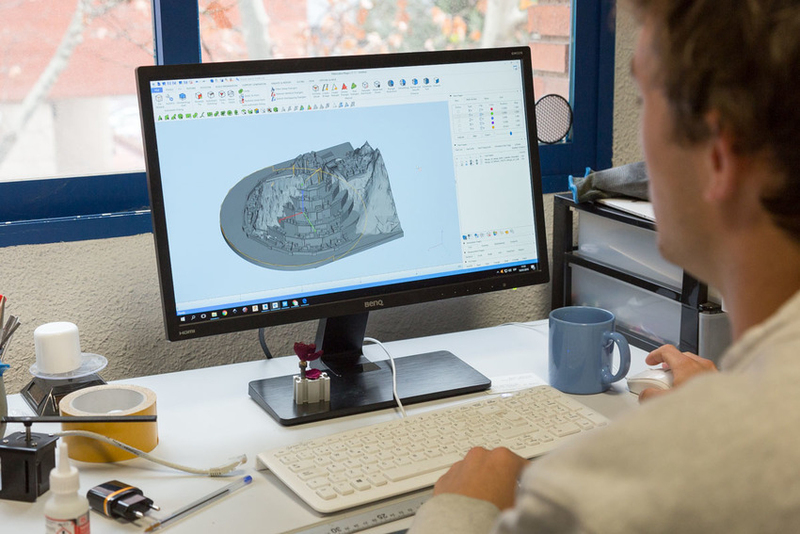 Discover our 3D modeling projects here. Learn more about our output technologies here.